First a canine whodunnit that may conjure a smile in the reader, second a thrilling performance of the skies with magic afoot and third a psychic hunter of acts of the macabre in great number. Great Economy of words that move through fluidly with an entertaining fun read, the brevity due to the hound voice, one not of long discourse, which can be a good thing. I loved Jack London’s canine tales. A hound that can smell out blood is a good thing for detection of an unsub. 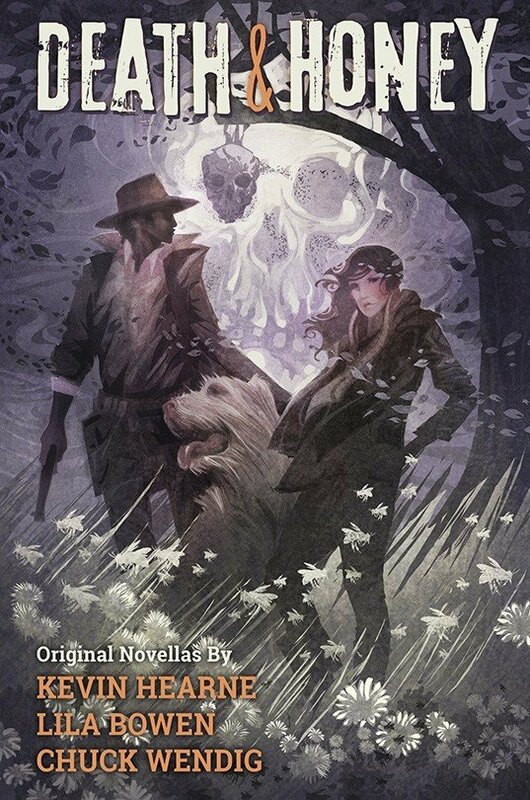 Oberon the Irish wolfhound and Starbuck the Boston Terrier and their human Atticus in search of devils, not the unseen kind, the Tasmanian kind, and maybe someone devilish as in murderer. Bees have part to play in here too. This trio new to me, memorable refreshing characters in storytelling, ones that have opened a whole new world of future reading and may do the same for other readers new to these characters. A refreshing whodunnit, cheerful and mysterious with fluid storytelling, opened up for new reader of this author’s tale with trio a druid biologist man and two canines. Kit Lawson aka Nettie Lonesome, Nat Hennessy, or Rhett Walker, with horse Puddin, two guns and Bowie knife, and bees, encountering mountains and magic afoot, did I mention he can fly and is… “murderous monster cowpoke with only one good eye and a body that was mostly scar tissue,” and fun too. He has a promise to be upheld, one of the hunting kind involving monsters. There are good monsters and bad monsters in the tale. A tale of search and rescue and triumphing over evil. Maybe today maybe another day but never dull day when Kit Lawson goes to play. I am newcomer to this authors work, Lila Bowen, a pseudonym for Delilah S. Dawson, and characters and had no idea of the characters and their origins. This would be great taster for reader being new to her writing. I am a lover of birds, their majesty, their swiftness and grace, those grand beaks and dinosaur like claws, a melody in the sky and melody of a performance in this tale. The Angel of Death, a name they gave to both Wren and Miriam. Wren is in this tale, not Miriam, she wants to be not killing people, and inevitably finds herself with Lissa on the hunt for killers, the serial kind. A short interlude in reading with psychic goings on hunting down monsters that have two legs.